A Gengar and a Nidorino are battling. Nidorino uses a Horn Attack on Gengar, but Gengar bounces back and uses a Hypnosis Attack. Nidorino falls asleep; the commentator thinks that it could be the end of Nidorino, but its trainer recalls it and sends in an Onix. A ten year old boy by the name of Ash Ketchum is watching the battle on TV. Pokémon objects clutter his room as he stands in front of the TV. He tells himself that he will become a Pokémon Master, holding up a Voltorb Clock. His mom, Delia, walks into the room and surprises Ash. He accidentally throws the clock. Delia catches it and it opens to reveal that the time is 11:00. She tells Ash to get to bed as she changes the channel. The town authority, Professor Oak, appears on the screen. He starts explaining about all of the new starter Pokémon: Bulbasaur, Charmander, and Squirtle. Delia tells Ash to go to bed when the show's over and to put on his pajamas. That night, Ash dreams about the starter Pokémon. First, he dreams about the starter Bulbasaur, and throwing its Pokéball to start a battle. Back in real life, his Voltorb Clock falls into his hand. He next dreams about sending in Squirtle to battle. He sits up in bed and talks to himself in his sleep. The next morning, a Dodrio crows as the sun rises on Pallet Town as Ash sleeps soundly in his bed. He dreams about Charmander and throws the Pokéball in the dream, while in reality, he throws the Voltorb Clock. It smashes against the wall and wakes Ash up. Realizing he's extremely late, Ash dashes out of bed and outside without changing out of his pajamas. Running down the road, he says to himself that any one of the starters is fine as long as he gets one. Reaching Professor Oak's Laboratory, Ash finds a crowd cheering for Gary. Ash pushes through some cheerleaders and runs straight into a boy wearing blue, named Gary. Gary tells Ash to call him Mister Gary! and to show some respect. He then pulls out a Pokéball and shows him his first Pokémon, which he won't tell Ash which one it is. He does say that it is the best one there is and that it helps to have a grandfather in the business. Gary announces to the crowd that he will make the town of Pallet known all around the world before setting off with the crowd following. Ash vows that he will beat Gary as Professor Oak appears behind him. Ash asks him where his Pokémon is; Professor Oak tells him that he looks like he's ready for bed. Inside the Lab, Professor Oak takes Ash to a table with three Pokéballs sitting on it. Ash says that he's thought about it for a while and he's decided to take Squirtle; he opens Squirtle's Pokéball to find it empty. He then chooses Bulbasaur and finds it empty. With just one choice left, Ash picks up Charmander's Pokéball, but it too is empty. Professor Oak tells him that there is one more Pokémon, but there is a problem with it. Ash, eager to start his journey, says that he'll take it. A platform opens up in the center of the circular table and a Pokéball emerges. Ash picks it up and sees that there is a lightning bolt on it. The Pokéball opens up and out comes a little yellow mouse: Pikachu. Ash picks up Pikachu, and ends up getting shocked while Professor Oak tells them that it can have an electrifying personality. Professor Oak holds out his hands, each holding something. In his left hand are six Pokéballs and in his right is a little red cartridge. He explains to Ash that they are Pokéballs and his Pokedex. Ash reaches to take them, and gets shocked again. This time, Professor Oak gets shocked too. Ash and Professor Oak head outside to find a crowd cheering and waving flags giving Ash support. Delia emerges from the crowd tells him that she packed some things for him, including sneakers, jeans, shirts, underwear, snacks, hot chocolate, rubber gloves, and a clothesline. Ash stops her and says that she embarrassing him and that Pokémon trainers can take care of themselves. Pikachu walks forward and Delia wonders why it isn't in its Pokéball. Ash tries to recall it and throws the Pokéball at it, but Pikachu bats it away with its tail. Ash tries again, and Pikachu kicks it back. The third time, Pikachu headbutts it back to Ash. They repeat the process as Delia watches, thinking they're playing catch. Ash picks Pikachu up, and Delia calls it weird. Pikachu doesn't like the comment and shocks everyone present, except for Professor Oak who tells Ash that the rubber gloves will come in handy because they block electricity. Everyone in the crowd faints as Pikachu watches, smiling. A short time later, Ash is walking along the path (having changed his clothes) with Pikachu tied to the clothesline and being dragged along behind him. Ash stops and bends down to ask why Pikachu doesn't like him. He tells Pikachu that it could be a little nicer, and then asks Pikachu to open up its mouth and tell him what's wrong. Pikachu opens its mouth wide and says its name, leading Ash to ask if all it can say is its name. Ash pulls out his Pokedex and consults staying in Pokéballs. Pikachu pushes a button and the Pokedex continues that there are exceptions and that some Pokémon hate being confined in the Pokéball. Ash unties Pikachu and takes off his rubber gloves as a Pidgey stomps along a nearby field. Ash scans it with his Pokedex and learns that Pidgey are perfect for beginning trainers. Ash tells Pikachu to go and get the Pidgey but Pikachu climbs a tree and won't listen. So Ash sets his backpack down and throws a Pokéball at the Pidgey. Pidgey disappears into the Pokéball and Ash thinks he's captured it, until it pops out again and leaves. Pikachu, still in the tree, laughs as the Pokedex explains that trainers usually have their own Pokémon battle the Wild ones. Ash gets an idea and heads for his backpack. A few moments later, Ash approaches Pidgey with his pajama shirt in his hands. Very cautiously, Ash creeps nearer to the Pidgey, finally trapping it under the shirt. A whirlwind of air pushes Ash off of Pidgey as his Pokedex comments that Pidgey can use Gust. It then says that Pidgey also know Sand-Attack. Ash gets hit by a Sand-Attack. He then spots a Rattata over by his backpack, taking things. The Pokedex tells Ash that Rattata is a Forest Pokémon. Ash wonders what a Forest Pokémon is doing in the field, so the Pokedex tells him that Rattata sometimes come out of the forests to steal things from stupid travelers. Ash picks up a rock and bounces it in his hand. He lobs the rock at a shadow at the top of a hill. It collides and Ash cheers for himself, thinking he's hit a Pidgey. The Pokémon glares at him as the Pokedex tells him that Spearow is a Pokémon that has a vicious temper and will attack humans and Pokémon. The Spearow takes to the air and swoops straight at Ash. Ash waves it off with his backpack, but it comes back, spotting Pikachu. Spearow swoops at Pikachu, who dodges it. The enraged Pokémon comes back and Pikachu drops to hanging onto the branch. Ash yells that Pikachu didn't throw the rock; the Pokedex informs him that Wild Pokémon tend to be jealous of Human-Trained Pokémon. As Spearow launches another attack on Pikachu, the little mouse releases an electric shock and Spearow falls to the ground. Getting up, Spearow calls out and tons of Spearow take to the skies from a nearby tree. Ash and Pikachu make a run for it as the Spearow come closer. Several Sandshrew duck underground as the flock passes; some Mankey watch the chase from their tree. The Spearow catch up and start attacking Ash and Pikachu. 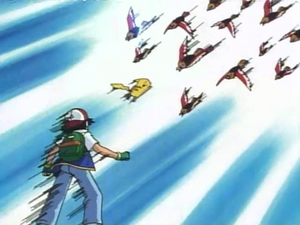 Ash scoops up his Pokémon and races forward. Reaching a cliff, Ash has no choice but to jump, and so he does. The rapid current carries Ash and Pikachu past a Magikarp and a Gyarados. On a rocky shore of the river, a girl fishes for some Pokémon. The line tugs on the pole and she realizes that she has a bite. She pulls on the line and Ash comes flying out of the river with Pikachu in his arms. The girl spots the Pokémon and asks, "Are you okay?" Ash responds that he thinks he is; the girl slaps him and corrects that she was asking the Pokémon. She tells him that he should take better care of his Pokémon and points him in the direction of a Pokémon Hospital. The Spearow appear above the trees on the horizon and Ash freaks out. He puts Pikachu into the basket of the girl's bike and takes off with it, despite her protests. Ash and Pikachu race through the forest on the bike. They cross a field as storm clouds gather overhead. The Spearow catch up to Ash and Pikachu. Jumping over a low cliff, Ash falls off the bike and lands in the mud a few feet from Pikachu. Ash tries to convince Pikachu to get into its Pokéball, telling it that it may be the only way to get help for it. Leaving the Pokéball next to his Pokémon, Ash confronts the Spearow, blocking Pikachu with his arms. He tells them that he will defeat and capture them all and shouts for them to come and get him. As the Spearow flock dives at Ash, Pikachu darts up to Ash's shoulder and leaps off. A bolt of lightning strikes Pikachu and Pikachu amplifies it with a Thundershock. The storm clears as Ash and Pikachu lay on the ground, unconscious. They wake up and realize that they've won. Ash looks up to the sky to see a golden bird flying away. It crosses a rainbow as the Pokedex says that there is no data and that there are many Pokémon still yet to be identified. Ash carries Pikachu along the trail, Viridian City comes into sight, and Ash walks towards it to get help for Pikachu.